Here's the latest word from Paul Krugman on Ricardian equivalence. First Lucas doesn't understand it. Now, not only does David Andolfatto not understand it, he can't read either. What's the world coming to? Who taught that idiot Andolfatto anyway? Send him back to Surrey for reading lessons. Maybe he should consider going back to drywalling. That’s saying that the spending response to expected future taxes leads to a fall in consumption that exactly offsets the expansionary fiscal policy. If that’s not a Ricardian equivalence argument, what is it? What's Lucas saying? There's a bridge, it's funded by increasing taxes. Lucas says it doesn't make any difference that the government does this. He also says the answer doesn't change if the taxes that pay for the bridge are current taxes or future taxes. The last part of that is Ricardian equivalence. So what is wrong with that argument? It could be the spending actually matters, regardless of how it is financed, and we could argue about that. It could be that Ricardian equivalence does not hold in practice, and we could argue about that. Does Lucas somehow indicate in that line of reasoning that he doesn't understand Ricardian equivalence? Absolutely not. I was telling people that I thought Krugman had to understand Ricardian equivalence. My undergraduates get it. Why can't he? I don't want to be accusing the poor man of lack of understanding or poor eyesight. Maybe he can clear this up? So he was saying that government spending can’t raise aggregate demand. Period. Figure that one out and I'll give you a prize. Krugman starts off by tellling us he's going to show us that Andolfatto was wrong. But put this Lucas quote together with the previous one, and Andolfatto's interpretation seems to be exactly what Lucas said. Lucas told us in the first quote that the government spending won't matter if it's paid for through taxation (present or future). Then, in the second quote, he says that it will matter if the Treasury issues debt to finance the expenditure, and the Fed buys the debt. What Krugman says to summarize, i.e. "so he was saying the government spending can't raise aggregate demand," is essentially correct, but that is not in contradiction to what Andolfatto said. I would not use the words "aggregate demand" in relation to what Lucas was talking about, but we'll let that one go. Look, I know people want to defend Lucas and hit at me, but what Lucas said there betrayed a fundamental failure to understand the implications of debt-financed spending — followed by an outright smear against Christy Romer. The question is about models and multipliers. Lucas tells us a story about how he imagines Christy Romer does her job. In fact, you can see how she does it in this speech from February 2009. She talks about how she and Jared Bernstein used some "very conventional macroeconomic models" to come up with a multiplier of 1.6, which she thinks is on the low side. As Lucas says, he thinks exercises like that are "schlock economics," and he's right. The "very conventional macroeconomic models" Romer is talking about are large-scale macroeconometric models which are fundamentally the same as the ones constructed in the 1960s and early 1970s - the FRB/MIT/Penn model for example. Those were the models Lucas criticized when he wrote this paper, which is part of what the question was about. It's not a smear to question someone's methods. Sorry, Paul. Ever since I started writing about the failures of modern macro, I’ve been attacked by people claiming that I just don’t understand the depth of their thought. Each time it turns out that they either are making basic errors or simply can’t manage to read what I and others actually wrote. And here we have another example. You have to pity the poor man who wrote that. Viciously attacked by arrogant failures who just can't get it right. Well, give me a break. What does Paul Krugman want exactly? If you go around badmouthing the cumulative work over 40 years of many macroeconomists - work that has been vetted by mainstream economic journals, hashed over in many hours of seminars and conferences, and awarded many prizes, including several Nobels - do you want a pat on the back, or what? The smearing isn't being done by Bob Lucas here. I'm pleased to hear that Paul Krugman does not like shallowness, particularly in the blogosphere. My guess is that most people would have a hard time putting his post into context, but I think he wrote it as a reply to my last post. Follow the "pulling rank" link in his last paragraph. Too bad that Krugman went shallow on this one. It would be much more interesting if he actually addressed the issues. As an update on John Quiggin and Zombie Economics, (which initially set Krugman off on his "pulling rank" nonsense), if you have not read my longer critique of Quiggin's book, it is published in the Australian National University E Press. The paper is not just about Quiggin's book. It also serves as a response to the people who think that all of modern macroeconomics needs to go out the window because the financial crisis happened. Apparently Quiggin seems bothered by my critique, though he does not address the substance. It seems he would be happier if it had been written by an Australian, and not just another colonial. I just read Paul Krugman's most recent blog post. This is typical. Krugman is repeating an argument he has been making for a long time. He wants you to think that he has it right, and that there are some "freshwater" (whatever that is) bad people out there who have it all wrong. How could they be so stupid? For reference, here's something I wrote back in March of this year on Ricardian equivalence, when Krugman was on about this before. I don't agree with everything Lucas said in that quote, but I think I can safely say that I know Lucas better than Krugman does. I think I understand what ideas he is attached to, and there is nothing in the quote that is inconsistent with those ideas. Further, for something pulled out of an off-the-cuff panel discussion, it's reasonably coherent. Lucas of course was a primary force behind the revolution in macroeconomic thought that occurred post-1970. But he is also very much an old-school Milton Friedman quantity theorist - an Old Monetarist if you like. That's what is behind the first part of the quote. He's thinking that it's monetary policy that is important, and that monetary policy effects will drive the effects of the stimulus. You may think that's wrong, but that's part of what he thinks. In the latter part of the quote he has a particular view of the effects of the spending package put in place in 2008. Supposing it is funded by taxation - current or deferred - he thinks it doesn't matter much. Now, even in the context of non-Keynesian macroeconomics, there are reasons why government spending can matter. There are wealth effects; public spending and private consumption might be complementary; a recession may be a good time for public investment in infrastructure. Maybe in the context of the 2008 spending package, Lucas thinks that those things do not matter so much. Maybe he thinks that the planned spending was not thought through very well, and we are better off without it. In any event, I don't see anything in the quote that we would want to condemn Lucas for. The weird part of this is that Krugman is picking on Lucas over Ricardian equivalance. The only piece of the quote that relates to that is the last part: "And then taxing them later isn't going to help, we know that." That's just stating the Ricardian equivalence proposition, which is that the timing of taxation does not matter. Tax me now; tax me later; it does not make any difference. Lucas certainly isn't getting anything wrong. Next, Krugman wants you to think, not only that Lucas is confused, but that he's somehow besmirching Christina Romer. If you read the quote, Lucas is not saying anything bad about Romer, he's just thinking about the realities of government. In my opinion, Christina Romer deserves besmirching, but all Lucas is saying is that, likely, Romer was not driving the policy, and that her job was to defend it, which is what she did. I’ve tried to explain why Lucas and those with similar views are all wrong several times, for example here. But it just occurred to me that there may be an even more intuitive way to see just how wrong this is: think about what happens when a family buys a house with a 30-year mortgage. Apparently that is supposed to be an "intuitive" way to think about Ricardian equivalence. This is an excellent illustration of Krugman's confusion. The example actually tells you nothing about Ricardian equivalance, or anything remotely related to the effects of government actions on the behavior of private economic agents. What's going on? In Krugman's example, a family takes out a $100,000 mortgage loan to purchase a house. This family now has $100,000 in debt, and someone else in the economy has a $100,000 asset. What is happening in the aggregate? If this is a new house, then the private sector collectively is foregoing current consumption, and investing in a house which will provide a future stream of consumption. If it's an existing house, then this could be a wash. For example, suppose that the family that sold the house takes the $100,000 it receives from the sale and puts it in a bank that makes the mortgage loan to the family that buys the house. Where is the Ricardian equivalence lesson in all that? Ultimately, Krugman should be able to do better than this. We're accustomed to his nasty side, but at least he could provide some useful instruction. Early on in this crisis I and quite a few other economists — but not enough! — declared that we had entered a classic liquidity trap. This is a situation in which even a zero short-term interest rate isn’t low enough to restore full employment; it is, if you think through the logic, a situation in which desired saving, or more accurately the savings people would make if we were at full employment, exceed desired investment even at a zero interest rate. The liquidity trap — which is in effect a special case of IS-LM analysis — has some special properties. Notably, even large government borrowing won’t drive up interest rates (not unless the borrowing is enough to restore full employment), and you can print as much money as you like without causing inflation. 1. This is not a "classic" liquidity trap. As I discuss at length here, in a classic liquidity trap the central bank is essentially trying to accomplish something by swapping currency for government debt, and those two assets are essentially the same. The nature of the liquidity trap we are now in is that a swap of interest bearing reserves for T-bills accomplishes nothing, because those two assets are the same, and that would be true whether the interest rate on reserves were 0.25%, 5%, or 20%. What gives rise to the modern-day liquidity trap is that there is a large positive stock of excess reserves in the financial system. Further, this liquidity trap is even more damning, as quantitative easing will not accomplish anything either - swaps of short-term debt for long-term debt simply get undone by the private sector. 2. Make government borrowing large enough, and interest rates will go up alright, liquidity trap, no liquidity trip, "full employment" (whatever Krugman thinks that means) or no full employment. We understand what that is all about. Make the government debt large enough, and it's unsustainable. 3. You can't "print as much money as you want without causing inflation." In spite of the fact that, in our modern-day liquidity trap, swapping reserves for government debt does not matter, the fact that the reserves are out there can matter for future inflation, but that depends on future central bank actions. If something happens to make the banks less willing to hold the reserves, the Fed can increase the interest rate on reserves so that the banks want to hold the reserves, with no resulting inflation. 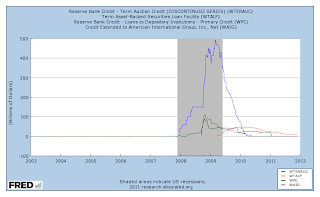 If Krugman means to say that the banks are going to hold the reserves indefinitely at 0.25%, then that's not right. 4. To say that IS/LM - a model with no dynamics, two assets ("money" and "bonds"), no credit, no default - is going to enlighten us, in the way Krugman thinks it does, about "how the world works," is a pretty bold statement, to say the least. More on that here. The moral of the story, then, is that one view of macroeconomics has held up very well in the Lesser Depression; the alternatives have been shown wrong again and again. How are we supposed to evaluate that? IS/LM seems a complete non-starter. How can you say it "holds up?" What are the alternatives that he wants to compare this to anyway? Are those alternatives something anyone even thinks about? As usual, you know the answers. The alternatives are straw men that exist only in Krugman's mind. Not content with the Santa-on-the-roof from days of yore, positionators have now discovered the two-storey inflatable reindeer. A status-enhancer if I ever saw one. You're saying that if boot polish applied to your balding head was good enough for Grandpa, that it's good enough for you. Forget it. We now have the hands-free hair rejuvenator. At $699.95, this will position you well. However, if that is a strain on your positional budget, $69.95 will get you a room-tidying pickup robot. This is a followup to my previous post. Robert Frank likes to talk about "positional goods." These are goods I like, not because they confer any direct benefit on me, but because I feel happy when I have more of this type of good than what others have. Similarly, I feel worse when others have more of this good than I do. Examples are large houses that are mostly empty or Beamers driven by people who couldn't tell the difference between riding in a Beamer and riding in a Hyundai if they closed their eyes. An extreme example is this house in India. Frank thinks that positional goods are ubiquitous and lead to social waste - basically, a lot of time and resources wasted over nothing. From his point of view the social welfare loss is large, and can be corrected with a progressive consumption tax. But hold on. Aldo Rustichini likes to study envy and regret. He is an economic theorist who also has in interest in economic experiments and neuroeconomics. Rustichini likes to view envy and regret as elements of psychology that propel learning and economic development. Envy is a force that makes me want to replicate the successful behavior of others, while regret is a force that helps me to correct my own errors so that I can become successful. To motivate these ideas, Rustichini likes to talk about how performance is evaluated in elementary schools in the United States. I went to elementary school in the 1960s in Canada, where we were graded in each subject, and were given a report card to take home with little else other than the odd short comment next to the grade - "shows promise," "improvement needed," etc. Grades were of course supposed to be private, but we knew what was going on. I felt good. Some others felt bad. Concern that some children in elementary school might feel bad led people in Schools of Education to push for changes in performance measurement in elementary schools. By the time my own children went to elementary school in the United States, grades had been ditched in favor of a lot of words that the teachers had to put together to describe performance on a report card. The parents get roughly the same message, but now the kids have a harder time figuring out who the top performers among their peers are. Rustichini seems to think that grades in elementary school are a good thing, and that the modern wishy-washy approach to student evaluation is thwarting envy, which will actually reduce the amount of learning that takes place. If you know who the top performers are in your class, you can watch them, see what they do, and try to replicate it. Maybe you can get them to show you a few things. What about "positional" goods? These can actually be performing a useful economic role, even if they are pure "waste" in the conventional sense. This is what signaling is all about. In a signaling model, acquiring a signal may be costly and a pure waste, but it reveals information because the signal is less costly to acquire for "good types." Sometimes people argue that there is a signaling component to higher education. It doesn't matter that you didn't learn anything in college, because employers know that only the smart and diligent ones actually finish. To get envy working as a force for social good, we need to be able to correctly identify economic successes. How are we going to do that if the successful people hide their wealth? Someone who pushes her Beamer off a cliff in public is demonstrating to us that she is successful - so successful that she can waste resources. I see this and it makes me curious. How does a person get so rich that they would be willing to destroy their Beamer? Maybe I can replicate her behavior and get rich too, not because I want to destroy Beamers, but because I want to relax my budget constraint in a big way. You don't want to tax the positional goods or pass laws against having them, for the same reason that you don't want to take grades away from the elementary school kids. In doing so, you are thwarting envy. When you do that, you will get less learning and less innovation, and on average we will all be worse off. This seems what everyone is focused on - occupiers, partiers, people who want to stay in office, people who want to kick those people out of their offices, etc. Plenty has been written on this, but I'll extract a small sample here in an attempt to sharpen the ideas. Let's start with the series that Robert Frank recently contributed to Slate. If you're unfamiliar with Frank, his view of the world is dominated by externalities. Why is inequality bad? That's because the filthy rich make the poor feel so bad that the poor will do any number of reprehensible things in an attempt to consume more. Frank is concerned with "habit." Economists like to think about two kinds of habit - internal and external. With internal habit I care not only about my current consumption, but about my current consumption relative to my past consumption. I'm better off with more current consumption, but more past consumption makes me currently worse off. With preferences like these, I become accustomed to a high standard of living. I'm much happier if I have always been poor than if I am poor today and rich yesterday. Internal habit is used a lot in macroeconomics. You see it in estimated New Keynesian models, for example Christiano/Eichenbaum/Evans, and in work on asset pricing. I think this has more to do with adding free parameters to fit the data than any micro evidence to support the idea, but there you are. In any case, internal habit is not going to help the arguments of people who want to redistribute income from rich to poor. Internal habit will tend to favor the status quo, as there will be large transition costs in terms of lost welfare from making the rich poorer. Further, if everyone in the economy has preferences with internal habit, I'm not sure what is Pareto efficient, or if anyone has even solved that problem. For all I know, you solve the problem and it looks completely goofy. Another favorite pastime was digging a tunnel under his home; he attributed the secret of his success to "visits by elves" while he worked in the tunnel: "While I'm digging in the tunnel, the elves will often come to me with solutions to my problem." Frank seems to think that external habit implies that we should all consume the same quantity. Thus, no more envy. Let's explore this idea further. External habit tells us something about the types of neighbors we like to have. Frank says that the best neighbor the richest person in the population could have is the poorest one in the population, as that makes him or her feel really good. But there is a problem, which is that the best neighbor the poorest person can have is the next poorest one. If you let everyone choose their neighbors, what will they do? This problem has actually been solved. Some of Ken Burdett's marriage models with search fit this exactly. The result is that there is positive assortative matching. Like types tend to match - poor with poor and rich with rich. Frank's theory thus explains neighborhood stratification, something which happens everywhere, and with a vengeance in St. Louis. So far, the theory looks pretty good. However, note that you would also get positive assortative matching if the externality goes the other way. If any individual feels happier the richer their neighbor is, then we get exactly the same outcome, with the same neighborhood stratification. Similarly, suppose in the marriage matching story that every individual prefers a taller partner to a shorter one. Then, there will tend to be matching of tall types with tall types, and short types with short types. But if each individual prefers a short partner to a tall one, you get the same result. So, which do you think it is? Do I prefer having a rich neighbor or a poor neighbor? If it's the former, and we follow Frank's logic, he has a lot of explaining to do. Given the conclusions he makes in the latter case, in the former case it would be a better society if we made one person enormously rich, with the rest of us living at subsistence. What does Frank think explains the recent increase in income dispersion in the United States? The received explanation for this is basically "supply, technology, and trade." Changes in technology have changed the relative demands for high-skill and low-skill workers, high-skill workers are scarce because it is very costly to acquire the skills, and low-skill-intensive goods can be produced more cheaply abroad than used to be the case. A small amount of the increase in dispersion in income is due to the US income tax becoming less progressive. But Frank has a different idea. This also has something to do with technology, though. Frank uses the example of music. Everyone in the world can now hear the best guitar player in the world, without going out of the house. So why should I pay any attention to the second-best guitar player in the world? Ultimately, the best guitar player in the world gets a huge market share, and second best gets close to nothing. Society then consists of a small number of stars getting enormous salaries and the rest of us getting close to nothing. But surely if second-best is willing to work for a little less, I might prefer that. Or seeing #500 guitar player in the local bar for a $5 cover charge could dominate paying $200 to sit in a nosebleed seat in Madison Square Garden to see #1. What seems to make Frank's argument fall apart is congestion and scale economies. You can see this when he gets to his other examples. Frank wants to think of his university president, David Skorton, as one of these superstars. First, contrary to what Frank seems to think, my guess is that Skorton earns something in the range $500K-$600K. An odd characteristic of the market for university presidents is that the high-paid ones are mostly at schools you have never heard of. There may be a theory that explains that, but I don't think it's the one Frank has in mind. Second, Skorton was my university president once as well. People at the University of Iowa thought of Skorton as a good guy, but I don't recall the word "superstar" floating around. Frank wants to dismiss corporate governance explanations for high executive compensation, but I'm not sure he's right. Small differences in the ability of a CEO may indeed make huge differences in corporate outcomes, but it's very difficult for a Board to discern those differences. How do you tell a good one from a bad one? Thus, you can't rely on those small differences to explain huge differences in compensation. Finally, Frank gives us his solution to inequality, which is a progressive consumption tax. A consumption tax is sometimes thought to have some virtues relative to the income tax as a means for generating revenue, but as typically envisioned, it would also be less progressive than the income tax. Replace the current federal income tax with flat-rate value-added tax generating the same revenue (I'm neglecting the issue of deductions), and income dispersion will increase. The problem is that, if the consumption tax is collected at the point of sale, it has to be a proportional tax. We can't have retailers checking their customers' total consumption, and even if they could there would be ways to game the system. Frank's suggestion is that consumers report their incomes and net asset positions, from which we can determine individual consumption, which we then tax progressively. Frank thinks that a progressive consumption tax will cure all our problems. Frankly, I don't see it. First, Frank has not thought through the tax evasion problem. How easy would it be to cheat in this system, relative to the current one? The cheating one would want to do is to under-report income and over-report asset accumulation. The income under-reporting problem is one that exists currently, so that is no different. However, over-reporting of assets is something new altogether. One could imagine that over-reporting could be quite easy. This might amount to shady appraisals or asset valuation that could be very difficult to check. Second, even if you can solve the evasion problem, what do you gain relative to a progressive income tax? With a progressive consumption tax, individuals have a greater motive for consumption smoothing over time. This works like an increase in risk aversion - not clear this is a good thing. Also, the consumption tax does not actually promote savings relative to the income tax, except because people are effectively more risk averse and will self-insure by saving more. Again, this is hardly a good thing. Otherwise, saving is just postponed consumption. If my current consumption is taxed and my future consumption is taxed, that's a wash in terms of the effect on savings. Indeed, ultimately the distortion shows up in labor supply. Next, some people have shown interest in this paper by Diamond and Saez. A key result that seemed to get these people excited is the calculation of a top optimal marginal tax rate (including all taxes) of 73%, relative to the current rate of 42.5%. There are two key assumptions that Diamond and Saez make to come up with the 73% optimal rate. First, we should not care about the welfare (at the margin) of the rich people. This argument is based solely on the notion that marginal utility of income is low for the top income-earners. Second, Diamond and Saez use a "behavioral elasticity" of tax revenue with respect to the tax rate of 0.25. To see how this matters, if you use their formula and an elasticity of one, you get an optimal top tax rate of 40%. Now, I know it is fashionable to dump on rich people, but I'm not sure we want to discount their welfare as much as Diamond and Saez want to. Preferences will matter here. For example, if we take internal habit persistence seriously, as some people like to, that could make us want to weight the rich and poor equally, by Diamond and Saez's logic. I'm not committed to habit persistence, but there may be some features of behavior that are not consistent with log utility, for example. Further, Diamond and Saez are thinking in static terms. In reality, there is mobility within the income distribution, and how much mobility is an important issue here. Given mobility within the income distribution, we all care, for selfish reasons, about how the rich are treated, as we all could be rich some day, or our descendants could be rich. 1. There's also an extensive margin. Tax people at a higher rate, and some drop out of the labor force. 2. Taxes affect occupational choice. Some work by Manuelli/Seshadri/Shin says that the effect of taxes on human capital is big time. Why do I want to undertake a costly and risky investment for a very small payoff? 3. Entepreneurial activity has to be very elastic with respect to tax rates at the top end. Why would I want to risk my own wealth or that of my close family for a very big payoff with very low probability, if that big payoff is taxed at 73%? 4. The United States is highly dependent on highly-skilled labor that migrates here from other countries. With a top tax rate of 73%, the Indian engineers might prefer to work in India, and the Canadian professors might prefer Canada. Thus, I think it is likely that tax revenue is much more elastic with respect to the tax rate, particularly in the long run, than Diamond and Saez are letting on. To evaluate this properly, you need a serious model, and they have not provided one. As a followup to this post and this one, I think we finally have this sorted out. Some people were arguing that the Fed's lending to financial institutions during the financial crisis was subsidizing those financial institutions. But the bulk of lending was through the Term Auction Facility (TAF), and it appears that, if there was any subsidizing, that it had to occur through TAF. But, we have a record of all the loans made through TAF in the excel spreadsheet here. 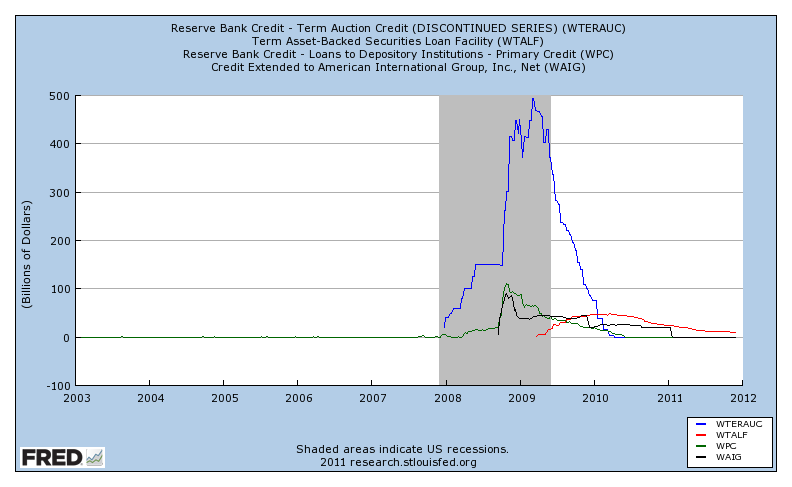 As you can see, the best deal that anyone was getting on a TAF loan was 0.20%, and all those loans occurred on January 2, 2009. Otherwise, the best deal was 0.25%, and no one could make a profit on that, given that the interest rate on reserves was 0.25% at the time, and the fed funds rate was lower than that, as were short T-bill rates. So, was the Fed doing the appropriate thing? Maybe reading Lombard Street will help us? Fat chance. As Andolfatto can tell us, there's not a lot in Bagehot to go on. Bagehot tells us that the lender of last resort should "lend freely and at a penalty rate" during a crisis, which if anything seems like a contradiction. If you really want the banks to take the liquidity injection, you should not be penalizing them. Of course it makes sense that the Fed should not set up lending facilities which allow banks to simply make arbitrage profits, but that does not appear to have been happening during the financial crisis. Further, if the Fed was giving the posted collateral the correct haircuts, it was not taking on undue risk, and certainly the Fed does not seem to have come out on the short end of the stick on its lending. I have some too-big-to-fail moral hazard concerns, but that is about it. The key question with these lending programs, as with any lender-of-last-resort lending, is why the central bank should not just buy the assets, instead of extending loans and taking the assets as collateral. I think the basic logic has to be that the central bank could buy the assets at their market price, but the market price is viewed as being inefficiently low. Instead, the central bank extends a loan for more than the market price of the collateral, and essentially takes the assets at a high price, temporarily. But, alternatively, the central bank could make an offer to buy quantity x of asset y at price p, and see how many offers come at that price. If total offers exceed x, then the central bank uses a lottery to choose. Questions like this come up when we try to model how collateral is used in financial transactions. Indeed, I have never seen a satisfactory model of collateral. Basically, you have to explain why it is that someone who wants to borrow, and has an asset that they can use as collateral, does not just sell the asset. One can see how this works with mortgage lending, but in general it seems a difficult problem. Of course, those two statements can both be true. Fernandez knows something, about which she is quite certain. As economists, we really don't know anything at all. Apparently we are good at thinking, but it's just fooling around - nothing more serious than video games. The methodology of economics is so strong that we have had a large impact on many fields, from political science to sociology and even neuroscience. It’s been a very successful paradigm in that what economics does very well is think rigorously. But sometimes that’s not been very fruitful in the sense that there are certain questions that you can’t ask because you don’t know how to model them. Ah, those pesky models, getting in the way of fruitful science. ... as “scientists” we often don’t have much to say. I don’t think we are scientists. I think we’re more like doctors in the sense that we do research, but in the end there’s a patient, and you have to say, given one’s knowledge, what’s the best way to treat the patient? Well, when I think about my doctor, what she does looks to me like applied science. She wants to do some tests on me. I ask her some questions about it. She cites scientific evidence from published research. When I talk to Jim Bullard I get the same vibes. He's doing applied science. He knows what's in the journals. He talks to his staff and other economists, and uses frontier knowledge to argue for good policy choices. That frontier knowledge is based on theory, i.e. models, and empirical evidence. Science, basically. But the people who go and give advice usually end up with a very bad rap in economics. I am amazed at how much hatred—and I will say hatred—Paul Krugman evokes from some fellow economists. But one of the reasons for this is that he says things for which there is not “scientific” support and which go against what these people believe is "good" economics. She's confused here. Krugman does not get a bad rap because he chooses to give advice. He gets a bad rap because some people, me included, think he is giving bad advice. We don't hate the man, we just disagree with him. And yes, this has a lot to do with science (no scare quotes).